Taylor-Made Deep Creek Vacations’ owners were able to get out of town and enjoy an O’s game in Baltimore last week. Thank you Lisa and Chris for manning the phones!! We started our night at Pickle’s Pub, to get their fried pickles, of course. Then headed off to the O’s game to watch the Orioles play the Seattle Mariners. We had dinner in the Camden Club and watched most of the game from up there. We also ran into old friends from Baltimore as well!! The following morning we headed off to the Inner Harbor to do some shopping before heading back to Deep Creek Lake. It has been too long since I have been to the Inner Harbor, we did not want to leave. We are already planning our next trip to Baltimore with all of the kids! 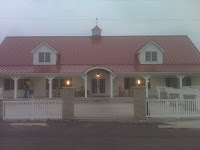 Joe and I had a wonderful dinner last night at The Hen House Restaurant, located in Grantsville Md. We enjoyed oysters in the half shell and a dozen large crabs! I had not been to the Hen House since they rebuilt a couple of years ago, and the new building is gorgeous with a large floor to ceiling stone fireplace and cathedral ceilings (sorry about the picture it was closer to dark). It was only a short drive from Deep Creek Lake, you can get there by Route 68 east or take Route 40 East (more scenic). Below is some information about The Hen House from their website. The Hen House Restaurant began more than four decades ago in Frostburg, Maryland. In 1961, Buck and Ginny Warn started the restaurant by building a cement addition on the side of their house on Bowery Street, which accommodated only nine guests. The restaurant’s featured selection at the time, chicken, became the namesake of their business. Sons, Gary and Bill Warn, were busy helping their parents at the restaurant, doing whatever chores were necessary and by 1975 the brothers had purchased the business from their parents. Through hard work, the number of customers continued to increase. A decision was made in 1979 to look for a new location so growth could continue. The Warns moved to their present location along U.S. Route 40, which was previously the Colonial Inn, built in 1929. The family business continues to thrive in its Old National Pike location, commonly referred to as Long Stretch, in Garrett County. An unusual aspect of the Hen House is its poultry name, but quality seafood reputation. While chicken was the featured item during the 1960´s, the Warn brothers expanded the menu to include fresh seafood. The Hen House, with seating for over 400, is now the largest seafood restaurant west of Frederick. Live crabs are delivered daily; fish, scallops, shrimp, clams, lobster, crab legs, and soft shell crabs are offered for seafood lovers. A large charcoal pit provides for tasty barbecue ribs. Even steak lovers are not neglected as their favorites are cooked to order. And yes, fried chicken is still on the menu. Votes of 50,000+ past guests identify Taylor-Made Deep Creek Vacations as the one of the top ten vacation rental managers for guest satisfaction. SEATTLE – June 11, 2009 – Escapia, Inc., the #1 provider of web-based management and marketing solutions for vacation rental managers today announced that Taylor-Made Deep Creek Vacations (http://www.deepcreekvacations.com/) of Deep Creek, Maryland was named the #3 Guest Satisfaction Superstar. Guest satisfaction ratings were collected and analyzed using the EscapiaOne ratings and review system. All ratings are 100% verified and were submitted by more than 50,000 past guests of vacation rental firms across the country. “We are thrilled to be recognized as the #3 guest satisfaction superstar by Escapia. We work incredibly hard to give our guests the best experiences possible so they’re happy to tell their friends. It’s nice to see that our hard work is paying off and our guests appreciate it” said Jodi Taylor-Refosco of Taylor-Made Deep Creek Vacations. “We had a wonderful time on our mini vacation. The chalet had a wonderful view and it snowed all day on Saturday and it was beautiful. The house was great and took care of our family just great. I would recommend Taylor-Made and the chalet to anyone.” –Guest, stayed in a five bedroom chalet. “Property location was perfect. Close to skiing and grocery. Easy to find and priced right. The bonus ski passes are reason enough for us to come back again. Would definitely recommend to our friends and would be happy to rent again next year!” -Lucy, stayed in a four bedroom house. Escapia, Inc., founded in 2000, is leading the Internet revolution in the $24 billion vacation rental industry with a comprehensive Internet business platform and breakthrough online marketing and booking services. Escapia empowers professional vacation rental management companies to reach new customers, manage guest and owner relationships, and perform trust-based accounting, housekeeping, maintenance and other mission critical aspects of their businesses. Seattle-based Escapia can be reached at 1-800-ESCAPIA, info@escapia.com or via the web at http://www.escapia.com/. About Taylor-Made Deep Creek VacationsTaylor-Made Deep Creek Vacations (http://www.deepcreekvacations.com/) is family-owned and operated to specialize in providing the most memorable family vacations. Their reservation staff place guests in dream vacation homes every day of the year. Taylor-Made’s knowledgeable and caring staff is dedicated to providing the best customer service to ensure the most of their guests’ vacations. Taylor-Made has a combined twenty-five years of experience in the property management industry. Taylor-Made Deep Creek Vacations’ top grade service and high standards allow them to provide every vacationer their special dream home.